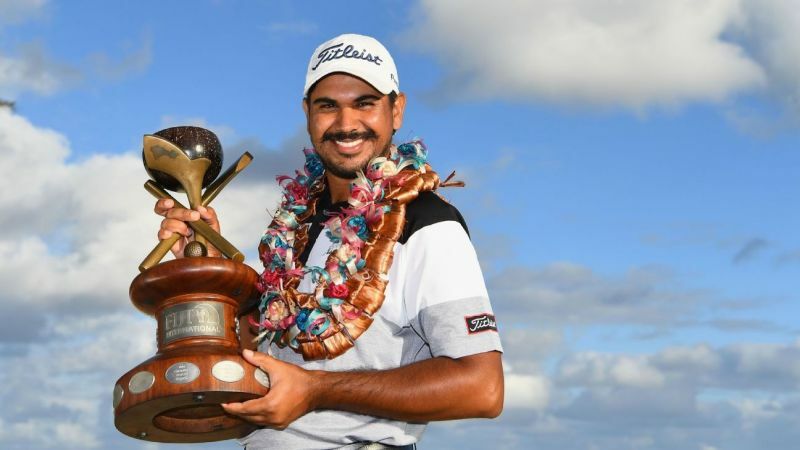 Indian golfer Gaganjeet Bhullar fired a sizzling six-under 66 in the final round to claim the Fiji International title, his first win on the European Tour. Bhullar, 30, thus became the most successful Indian player on Asian Tour and the first Indian to win on Australasia Tour. This was his ninth Asian Tour and 10th international title. Bhullar sank five birdies, an eagle and a bogey in the final round to take his four-day total to 14-under 274 and notch up a one-stroke victory over Australia's Anthony Quayle, who carded a sensational nine-under 63 today. South Africa's Ernie Els (65) and Australian Ben Campbell (66) finished at tied third spot. Bhullar joined Arjun Atwal, Jeev Milkha Singh, SSP Chawrasia and Anirban Lahiri as the only Indians to win on the European Tour as this was sanctioned by Asian, Australasia and European Tours. The victory also granted him an exemption on all three Tours till end of 2019. Other Indian in fray, Ajeetesh Sandhu scored 71 in the final round to end his campaign at the tied 43rd spot.